A family hams it up on their E Ticket ride along the Queens Garden Trail. Who remembers The E Ticket Ride? If you were a lucky kid, you actually got on an E Ticket Ride. If you knew what an E Ticket Ride was, you always dreamed about them. 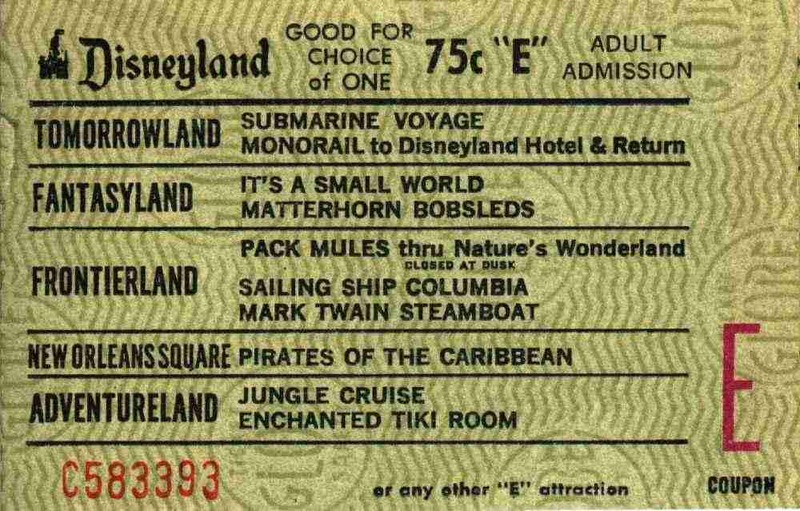 Long after E Tickets faded from the original Disneyland legacy, the phrase “An E Ticket Ride” has lived on. To be sure, it may not be as prevalent in today's textual lingo as it once was. But the legendary E Ticket Ride will forever occupy a spot in the Hearts and Spirits of those who knew them. 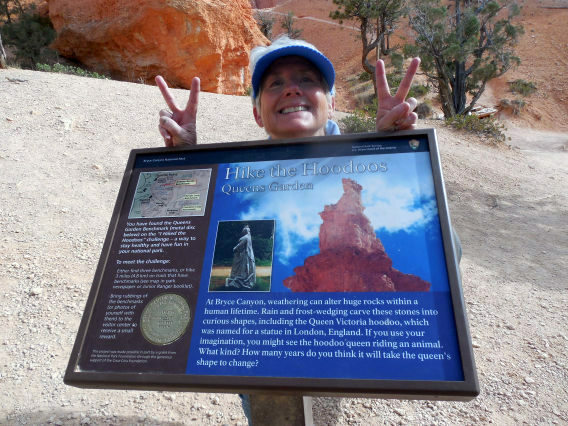 The Bryce Canyon National Park trails system is an E Ticket Ride. Without doubt. 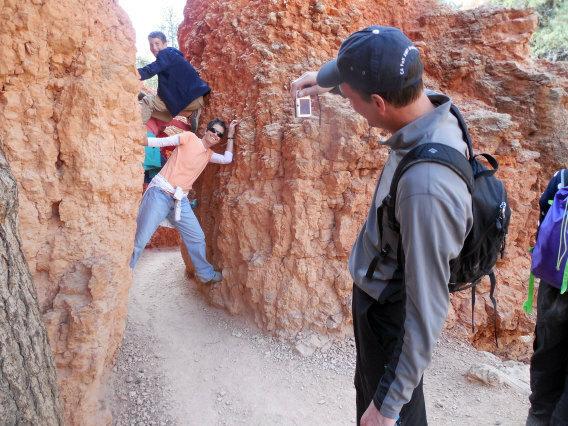 The Bryce trails are so fun, wanderful and downright exciting. No matter how many times we may have climbed aboard the Bryce E Ticket Ride, we are just as exhilarated as the first time. 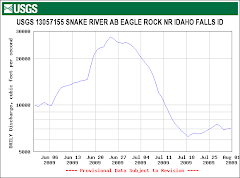 Most every National Park has at least one E Ticket Ride. Some parks like Grand Canyon have a kaleidoscope of E Ticket Rides, maybe enough E Tickets to last a lifetime. 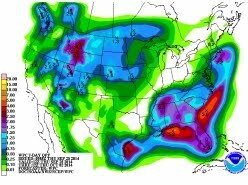 The Bryce E Ticket certainly isn't as epic as a Colorado River trip or The Rim To Rim or a couple of night's at Phantom. However, what the Bryce E Ticket may lack in once-in-a-lifetime superlatives, it makes up for it by being easy to access and dependable and predictable every time. When you lace up your boots and strap down your pack and hit the Bryce Trails, you are truly on an E Ticket ride that's unique in the National Park system. No other National Park can boast a Hoodoo Wanderland. No other National Park has such a compact, yet dramatic day hiking trails system suitable for E Ticket holders of all ages. No matter which E Ticket Trail you chose to tread, you can be sure you will finish your hike with the same sense of excitement as those moments from yesteryear when you stepped of one of the original Disneyland E Ticket rides. Many Thanks to those long gone Old Timers who laid out Bryce's spectacular trails. Many Thanks to those NPS crews who have carefully maintained the trails over the decades of their existence. Many Thanks to all those who keep Bryce Nice. Two benchmarks down--only one to go---the one in Peekaboo Loop. Then Susun can go get her "small reward" from the NPS.